To be a consistently successful hunter, you must know something or a lot about the wild turkey. This is especially true if you want to be a successful wild turkey hunter. 1. Adult gobblers assemble into flocks of various numbers, beginning about mid-summer and persist until the next spring break-up commences in early spring. 2. 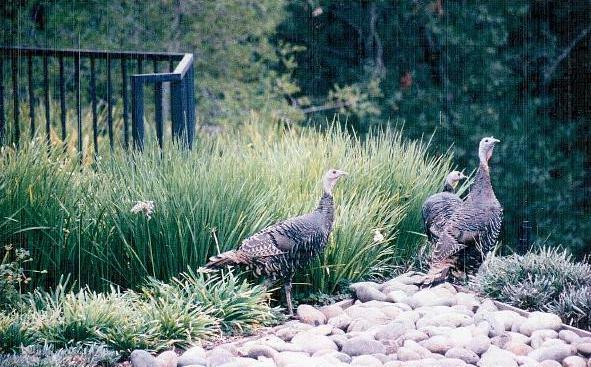 Young gobbler flocks begin to appear in early winter and persist as a distinct flock to adulthood or merge with a flock of adult gobblers after breeding season. 3. Unlike gobblers, adults and young hens flock together. Hen flocks begin to form as the nesting season ends, and flock size often increase in number until winter. "Barren" hens or those which fail to hatch a brood of poults, usually join with a hen and her young brood. Later, additions are probably made up primarily of "young of the year", which become separated from their own flock. Hen flocks are not as apparent to most observers as are gobbler flocks. Often, they are forced by more aggressive gobblers to occupy portions of the winter range that are less accessable to man. Break-up of hen flocks begins in late winter, by summer, none remain. 4. The family flocks consist of hen or hens with brood. These flocks form at hatching, and often last until mid-winter or spring. These are imortant flocks to managers. Many large family flocks indicate successful reproduction and good prospects for future hunting. Flocks begin to breakup in late winter or early spring, at which time the old, mature gobblers set up poor defined breeding territories. It is at this time that the gobbling begins. These old Toms will mate with five or more hens. When the mating is complete the cycle starts over.